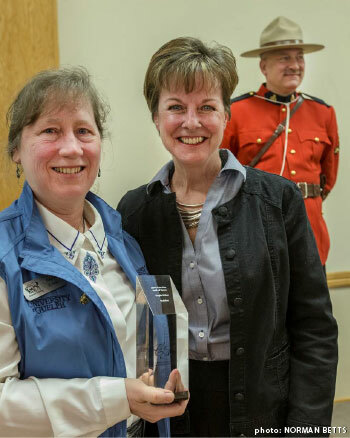 Equine Guelph director, Gayle Ecker entered the Can-Am All Breeds Equine Expo Hall of Fame, receiving a "Builder Award" in an induction ceremony held on Can-Am’s opening day, March 28th at the Orangeville fairgrounds. The Can-Am Hall of Fame was launched in 2013 in conjunction with the show’s move to Ontario’s Horse Country. Designed to honour and recognize world-class contributions to the equine industry, the program welcomes nominations from the public in a variety of categories. Submissions are narrowed down by an elected committee comprised of knowledgeable industry professionals. Three awards were given out in 2014 including: Jennifer Anstey, of the Horse Publications Group, under the media category, the Carter Family of Carters Training Centre under the builder category and Gayle Ecker of Equine Guelph at the University of Guelph, also under the builder category. Gayle Ecker is currently the Managing Director of Equine Guelph and has been its leader since its inception in 2003. Ecker also played an instrumental role in its birth. She has dedicated her energies to advancing the equine industry through education and communications. Gayle created the ‘pyramid of education’ model – an educational approach that provides learning pathways for career development at all levels (youth education > industry skills > Equine Science Certificate > higher education Diplomas) in the equine industry. In collaboration with the Office of Open learning, Gayle developed the Equine Science Certificate, the Equine Business Certificate, the Equine Welfare Certificate and the Diploma in Equine Studies – all on-line programs targeted to the equine industry. She also acts as an instructor in the program. Combining the science-based knowledge from the research programs to support the health and welfare of horses is an important passion in her life and one she encourages in the members of the horse industry. A former researcher, Gayle’s expertise is in the area of exercise physiology. She has been the Assistant Chef d’Equipe for the Canadian Endurance Team, traveling around the globe with the team to international events like the Pan-Am, the World Equestrian Games, and World Endurance Championships. These days, Gayle takes pleasure in riding her two Quarter horses through the wooded trails of her country home. Equine Guelph’s youth exhibit, EquiMania! made its first appearance at the Can-Am All Breeds Equine Expo nine years ago in 2005 and has been to every Can-Am event since. EquiMania! has grown every year into the over 5,000 pound display of interactive education and fun for youth and family alike. 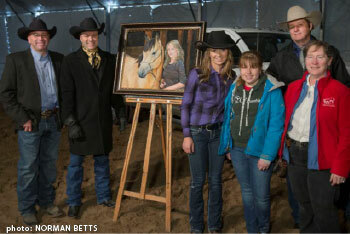 This year at Can-Am, a painting of Amber Marshall by Mark Grice of Alton, Ontario was auctioned off with the proceeds going towards EquiMania! Equine Guelph would like to thank artist, Mark Grice, Ross Miller and the group at Can-Am for their continued support of youth education and the EquiMania! exhibit. EquiMania! would also like to thank all its generous sponsors: Greenhawk, Kubota Canada, Ontario Equestrian Federation, Shur-Gain, SSG Gloves, System Fencing, Workplace Safety and Prevention Services and Zoetis.